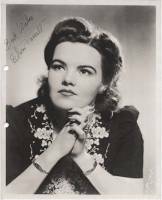 In 1942 she made her concert debut on CBS radio where she soon presented her own radio program. During 1947–1948, she toured the US as a concert singer, and in 1949 she toured South America. Farrell's song recital in New York in October 1950 was enthusiastically acclaimed and secured for her immediate recognition. That year, she also appeared in a concert performance of Berg's Wozzeck as Marie. Subsequently she was engaged by Toscanini for a performance of Beethoven's Ninth Symphony with the NBC Symphony Orchestra. In the 1955 film Interrupted Melody, which starred Eleanor Parker as Australian soprano Marjorie Lawrence, Farrell's voice was used for the singing parts while Parker lip-synched. This film, along with the Wesendonck recording featured in Artsconverge, demonstrate how she might have had a top career as Dramatic and Wagnerian Soprano. But she did not conform to the complex biases of Rudolph Bing, GM of the Met. Farrell was equally at home singing pop material and was one of the few opera singers who could sing "Old Devil Moon" and other classics and not sound like an opera singer singing pop tunes.